Imagine you’ve identified the perfect influencer. Great, but what comes next? It’s a little like asking your secret crush to dance at prom. While you already know that you’re perfect for each other, your influencer has no idea you have been eyeing him or her. For better or worse, that first impression does actually matter. The first time you approach an influencer, you need to have all your ducks in a row. That first contact is crucial to the influencer’s decision of whether or not to work with your brand. Your message should include all the important information needed to elicit the influencer’s interest but should not contain every single detail. 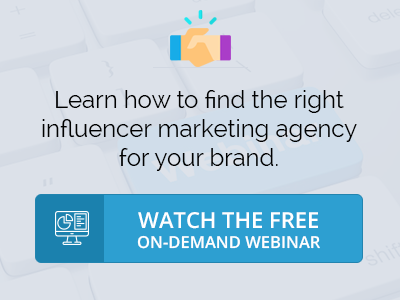 To find out more about what brands should expect when working with influencers, watch our free on-demand webinar with Laura Pier, Managing Director of Social Match. Most of the time you will be able to find contact details on the influencer’s social media profiles or at least on the influencer’s blog. Most list an email address where they can be contacted, but some may only have a contact form. Depending on the influencer’s name recognition and size, you will not always be able to contact the influencer directly. Sometimes you’ll have to go through a manager or influencer relationship platform. Keep in mind that depending on your company’s process and the influencer’s way of handling things, up to four parties can be part of the communication process. The influencer might receive hundreds of emails and partnership requests every day, so the subject line has to stand out in an overstuffed mailbox. With a good subject line you can spark the influencer’s curiosity, so the subject line should not look like an impersonal template. Either state the purpose of your email or refer to one of the influencer’s postings or articles. This might entice the influencer to open your message. Keep your first influencer proposal brief and simple. The first email is about introducing yourself and the company, stating your purpose and showing interest in cooperating with the influencer. Introduce your brand, its values and briefly outline your campaign and its objectives. The single most important piece of information to include is the timeline for your campaign. Emphasize when content development begins, when the bulk of the work will take place and when the campaign must launch. One last thing- even though you want the influencer to be excited to work with you, don’t hand out all information about your campaign. If the influencer isn’t interested, you don’t want them to know every single detail of your campaign. Influencers are creators, not numbers. Outline your honest interest in the influencer’s work and not just in his or her reach. Concisely explain in your influencer proposal why the influencer is a great fit for your brand by pointing out characteristics and details that you appreciate most on their Instagram account. Acknowledge his or her work without being too flattering. Remember that the influencer is a human being whose self-promotion is a main aspect of his or her work. It is not only what you say, but how you say it. So, write an individualized email and include a little of your own personality in it. Make sure to include a closing statement in your influencer proposal indicating that you would be happy to provide further information and how they can best be in touch. After a successful first influencer approach and the exchange of emails, you will need to set up a structured Influencer Briefing.